After forsaking the frozen tundra of Edmonton for the soggy loam of Vancouver, Hot Panda are set to return with their third studio album. The record, Go Outside, comes out on July 17th. Rarely does a band show the kind of growth album to album as we hear here from Hot Panda. While their previous efforts were enjoyable indie rock, Go Outside takes things to another level. The songs on the new album are more complex and diverse than anything what the band has offered up before. Kicking things off is "One In the Head, One In the Chest", a fuzzy ball of rock energy. It's the cut most characteristic of the band's prior work. Melody is explored on the pop ditty "Maybe Now?" and the jangly post-punk "Language". A pop sensibility takes over with "Littered Coins", a song reminiscent of a stripped-down Superchunk number. Things that a dreamy turn on a number of tracks. "Winter Song" lives up to its name with a blowing, twinkling aura. The brooding and tense rhythm of "Future Markets" brings some darkness. A New Wave hurky jerky keyboard clips throughout "See You All Around". Surprisingly even horns make an appearance on "Holidays". 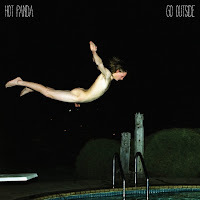 Hot Panda have done something noteworthy on Go Outside. They have managed to expand their sonic palette without sacrificing the things that made them appealing to begin with. It's a rare achievement. Best tracks: "Language", "See You All Around"